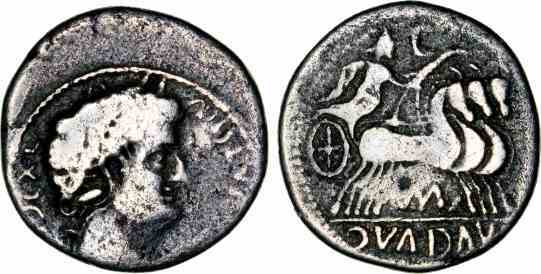 Silver denarius, 18mm, 2.28gm, issued c. 35 BC. Obv: Head of Antony right. Rev: Victory in quadriga right. This strange coin couple of a copy of an obverse die bearing Antony's portrait, with a common reverse type of earlier Republican denarii. The flan is thin and the coin under weight and it appears to be contemporary barbarous imitative issue.